Computer models are being developed for the watersheds feeding Napa City's two reservoirs, Hennessy and Milliken, and a report on the modeling will be presented to the Board of Supervisors on 3/19/19. The models will allow for predictive evaluation of water quality in the reservoirs using climate and land development inputs. This water quality analysis model has become a concern for the city because the potential impact of vineyard development in the watersheds brought to the fore by opposition to the Walt Ranch project in the Milliken Watershed. As more and more of the watershed areas are being developed to vines the question of siltation from soil disturbance in the conversion and farming processes and the question of chemical contamination from agricultural fertilizers and pesticides has become increasingly important in the protection of municipal water supplies. The process raises again the importance of including the Rector Reservoir in any study that links vineyard development to reservoir health. Unfortunately, since Rector is a State responsibility, the opportunity to compare the water quality of Yountville and Veterans Home water supply and its vineyard development impacts to those of Napa City is complicated by bureaucratic turf boundaries. The comparison would be valuable. 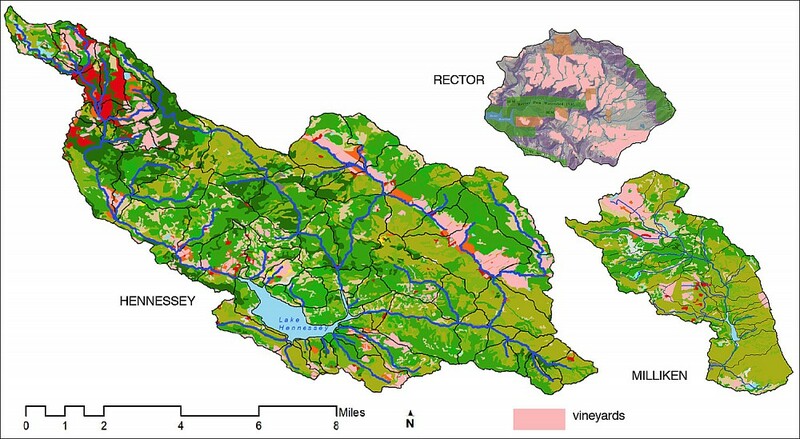 At present, the Hennessy and Milliken watersheds each have an 8% coverage in vineyards. By contrast the Rector Watershed is 21% covered in vines. If there are impacts to water quality by vineyard development, Rector should provide a more reliable demonstration of the impacts than the other two. So far the model doesn't seem to be looking at the buildup of siltation in the reservoirs, which is an aspect of the water supply system. An extensive 2009 report on the health of the Rector Reservoir found that the drain for the reservoir (it has a drain! - in addition to the water intake ports further up) was on the verge of being silted over.